Relish that rush-of-wind feeling every time you take a sip. Riding up the mountain: Exciting. Zipping down it: completely, utterly exhilarating. Relish that rush-of-wind feeling every time you take a sip with this clever, conversational set of glasses. 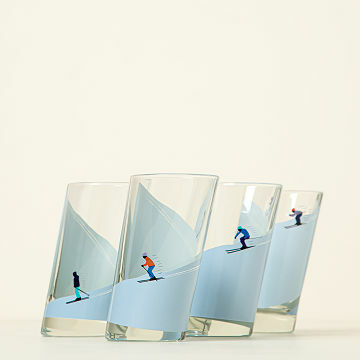 Featuring illustrated graphics of four skiers, each in a different spot on the slope, the slanting glassware is a fun gift for free spirits who live for fresh powder. Glassware made in Italy, decorated in Edina, Minnesota. I purchased these for our first ski trip, with friends who have skied their entire life. My friend fell in love with them and what started as a treat for me ended up being a gift for her! Best gift for a skier EVER!!! These glasses are made of thick glass and are so much more beautiful than they look in the catalog or online. If you have a skier you need to find a gift for...THIS IS THAT GIFT. I NEVER comment on items, but I had to with this purchase. When he opened him, and I saw them...I'm sure he thought I spent far more than I did. Wonderful item and so stylish. Would've liked them to be more the size of a pint glass. My ski buddy immediately purchased 4 more!! This being a birthday present for my son-in-law, I have not used the glasses myself. I'm writing the review to comment on the design-- the sloping glass, combined with the way the skiers progress downslope in each of the four glasses, is truly inspired.